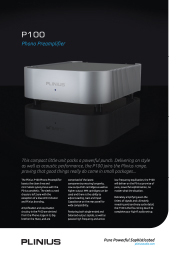 The Plinius P100 Phono Preamplifier boasts the clean lines and minimalism synonymous with the Plinius aesthetic. The sleek curved chassis is left bare with the exception of a blue LED indicator and Plinius branding. Amplification and equilisation circuitry in the P100 are derived from the Phono stage in its big brother the Hiato, and are comprised of the latest componentry ensuring longevity. Low output MC cartridges as well as higher output MM cartridges can be used and there is the ability to adjust Loading, Gain and Input Capacitance on the rear panel for wide compatibility. Featuring both single ended and balanced output signals, as well as passive high frequency and active low frequency equilisation, the P100 will deliver on the Plinius promise of pure, powerful sophistication, no matter what the situation. Delicately amplifying even the tiniest of signals and ultimately revealing extraordinary audio detail, the P100 is the flourishing touch to complete your high-fi audio set-up.